If you thought the Adelaide hinterland was all about Devonshire teas and lace doilies, think again. The Hills are alive with art, fine food, great wine and cool, contemporary interiors. 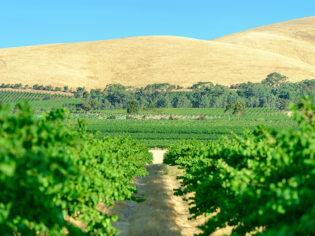 The Adelaide Hills are in South Australia’s Mount Lofty Ranges, a mere half-hour drive up the South Eastern Freeway (M1) from the heart of the Adelaide CBD (or 45 minutes from the airport). You’ll drive through the Heysen Tunnels, which are named after respected local landscape painter Sir Hans Heysen (more of him later). Why are the Adelaide Hills so great? Because the region is so diverse. It’s a little bit country – expect rolling hills, curvy mountain drives, native bushland and heaps of vineyards. It’s a little bit suburban, too – you’ll spot beautiful heritage homes with landscaped colonial gardens for that could-we-live-here house perv (I don’t know what you do on holidays, but that’s one of my favourite pastimes!). Hay bales in a famous Adelaide hills paddock. It’s also an urban satellite – the Adelaide Hills are close enough to the CBD that many city workers choose to live in the area, which means there’s a certain amount of affluence. And where there’s money, there’s generally great food, coffee, shopping and art. Which are all the things that combine to make a great, relaxing holiday. Of course, there’s also the region’s colourful cultural heritage, which makes it extra special. Some of the first German settlers in South Australia populated the Hills, and vestiges of the old world survive, such as Lutheran churches, cool-climate orchards and vineyards, boutique brewers and great restaurants. Streetside sausage sizzles in Hahndorf feature bratwurst. Yum! The Cedars (Hans Heysen’s House): Speaking of house envy, you’ll get it big time on a visit to landscape painter Hans Heysen’s home and studio. During his lifetime, he was a prolific and lauded artist famous for his majestic depictions of gum trees, which he used as his “models”. Hahndorf Academy: Regional arts, crafts and jewellery, and a heritage museum. The Hahndorf Academy, built 1857 as as a school of higher learning. Oakbank Heritage Walk: An hour-long stroll from building to historic building. There are 40 sites with plaques to give more info. Onkaparinga Valley Rd, Oakbank. 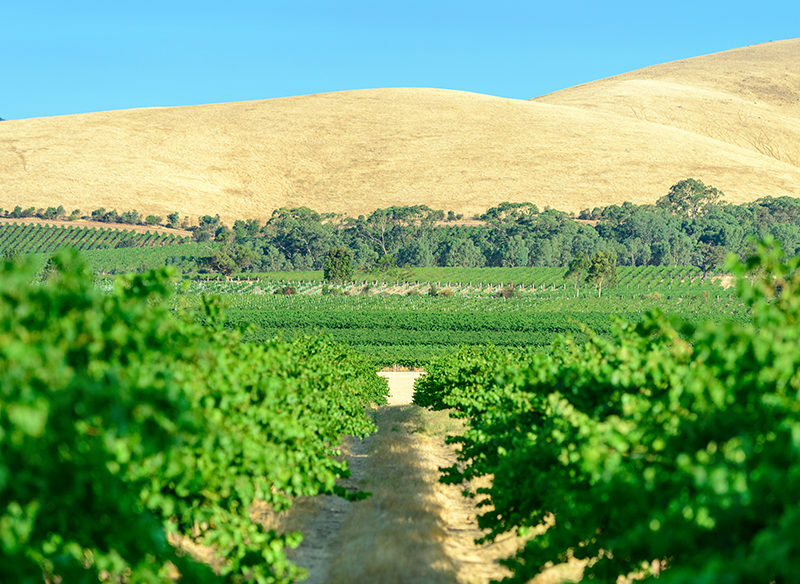 Onkaparinga River Scenic Drive: Stretching from the Verdun Interchange to Birdwood (where you’ll find the National Motor Museum), it’s the quintessential Adelaide Hills touring route – 45km of vineyards, bush, cute towns and antiques stores. I’m not a big wine drinker, so to me the Adelaide Hills are all about the food. The White House: Inexpensive French-style fine-dining in a sweet little café in a colonial house with a white picket fence and streetside seating. Don’t believe the place up the road with the sign “Best Coffee in Town” – you’ll actually find it here. 90 Mount Barker Rd, Hahndorf. The Stirling Hotel: A bustling pub bistro and fine-dining option. See Where to Stay. The Lane Vineyard and Bistro: OK, so this is also a Where to Eat. You can come to this beautiful hilltop cellar door for wine tastings but you’d be doing yourself a disservice not to order lunch, too. Hahndorf Hill Winery: Visit two stars of the cult book Wine Dogs Australia, and indulge in a wine and chocolate tasting while you look out over the vine rows. The Adelaide Hills are also home to a smattering of microbreweries. If you have time, check out Lobethal Bierhaus (3a Main St, Lobethal), Grumpy’s Brewhaus (115 Mount Barker Rd, Verdun). And see the heritage building housing Johnston’s Oakbank Brewery (18 Oakbank Rd, Oakbank), which ceased making beer in 1914 but now does homemade cordial. Craft ciders are also big in the Hills. Any local restaurant’s wine list should include the Hills Cider Company’s apple and pear alcoholic ciders. Hot tip: they are delicious! Mount Lofty House: Branded Grand Mercure, the interior of this maze-like heritage stay is due for a refurb, but that’s probably why it’s relatively affordable (from $199 per room per night; the Manor Indulgence Package includes a spa treatment and three-course dinner and costs from $425 per couple). I’d recommend the Stirling to couples and style-savvy travellers over 30 and Mount Lofty House for people with more traditional taste.